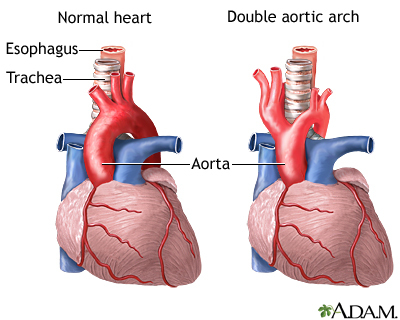 Double aortic arch is a common form of a group of defects that affect the development of the aorta in the womb. These defects cause an abnormal formation called a vascular ring (a circle of blood vessels). In double aortic arch, some of the arches that should have disappeared are still present at birth in addition to the normal arch. Babies with a double aortic arch have an aorta that is made up of two vessels instead of one. The two parts to the aorta have smaller arteries branching off of them. As a result, the two branches go around and press down on the windpipe and the tube (esophagus) that carries food from the mouth to the stomach. Double aortic arch is very rare. Vascular rings make up a small percentage of all congenital heart problems. Of these, a little more than half are caused by double aortic arch. The condition occurs equally in males and females. It is often present in people with certain chromosome abnormalities. 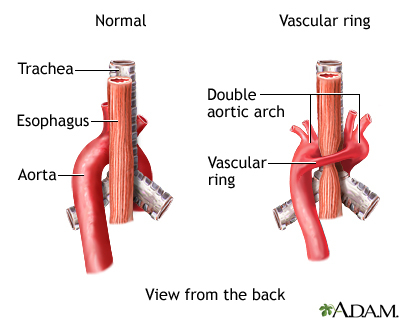 The double aortic arch may press on the trachea and esophagus, leading to trouble breathing and swallowing. The severity of the symptoms depends on how much the aortic arch is pressing on these structures. The symptoms may lead a health care provider to suspect double aortic arch. Other tests will then be needed to confirm the diagnosis. Surgery can be done to fix double aortic arch. The surgeon ties off the smaller branch and separates it from the larger branch. Then the surgeon closes the ends of the aorta with stitches. This relieves pressure on the esophagus and windpipe. Most children feel better right after surgery, although some may continue to have breathing symptoms for some time after surgical repair. This is most often due to weakness of the trachea because of the pressure on it before surgical repair. Call your provider if your infant has symptoms of double aortic arch.